Former Loew’s Kings Theatre. Photo: Jonathan Reingold. Request for Proposals seeks tenant for 80-year-old building in need of $70M in repairs. 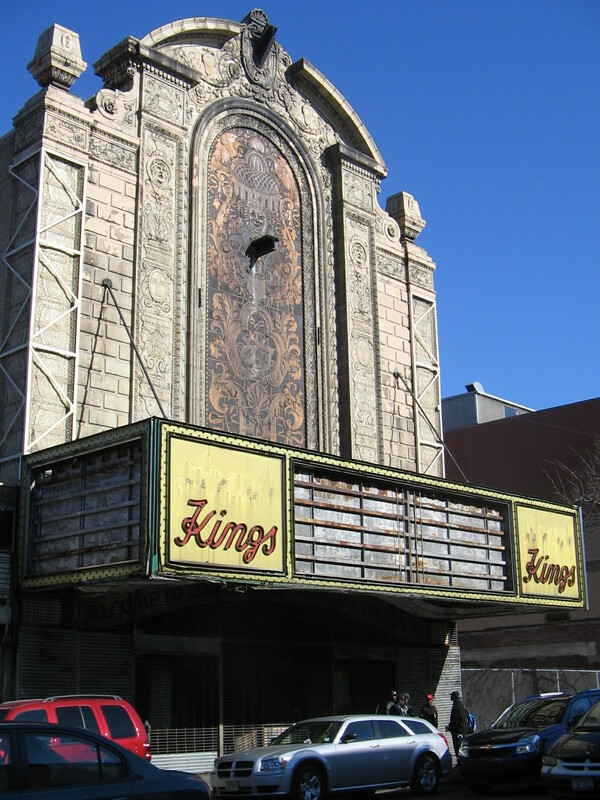 The New York City Economic Development Corporation is seeking proposals for a developer to lease, rehabilitate, and reuse the former Loew’s Kings Theatre at 1025 Flatbush Avenue in Brooklyn. The vacant building, located between Beverly Road and Tilden Avenue, opened in 1929 as Loew’s flagship theater. The designers of the 3,195-seat, French Renaissance-style building were heavily influenced by the Palace of Versailles and Paris Opera House. Its unique design features include a 70-foot-high orchestra dome, ornate plaster walls, and crystal chandeliers. Because the building has been vacant since 1978, extensive rehabilitation work is required on the theater’s exterior and interior. Sections of the roof are missing, interior walls are water damaged, and the theater contains lead, asbestos, mold and guano. EDC estimates that it will cost 70 million dollars to rehabilitate the building. The building is zoned C4-2, which permits movie and live entertainment theaters, banquet halls, department stores, production studios, and restaurants. The theater contains 68,300 sq.ft. of usable space. The RFP offers the option of leasing several City-owned parking lots located behind the building, which may be developed in order to allow the building to expand its theater stage and backstage areas. EDC recommends that proposals focus on providing community-oriented programming. While the developer will be required to fund the rehabilitation and operation of the building, the RFP states that developers may seek Historic Rehabilitation Tax Credits, City capital funds, private grants, and the sale of the theater’s naming rights to mitigate costs. Proposals would not be subject to the City’s land use review process provided that they are consistent with existing zoning restrictions and the 1980 Kings/Flatbush Commercial Redevelopment Plan. The City Art Commission will review the winning proposal, however, as the City will retain ownership of the property. EDC has set a May 7, 2008 deadline for all responses. EDC: Request for Proposals – Loew’s Kings Theatre (Mar. 12, 2008).